Enter the fantastic world of Arthur Polonsky in Release From Reason, a documentary feature currently in production by his son, Emmy nominated director Gabriel Polonsky. Arthur’s mystical art defined him as one of the most important Boston painters of the 20th century.” His talents led him from Lynn, MA to the booming art scene of post WWll Paris, acclaimed international shows, and a feature in LIFE Magazine. He played a major role in creating the Boston Expressionist movement. In fact RFR is one of only a few films that covers this historic yet unheralded era in American art – as told by Arthur and in interviews with over 25 leaders of the Boston art community. Yet Arthur’s journey to renowned artist was a mystery to his son. So armed with his camera, Gabriel sets out to discover a side of his father that he never knew, and takes us along for the fantastic ride. Release from Reason is not a typical ‘PBS’ documentary. Through breathtaking art and intimate cinema vérité footage the film brings to life his journey to renowned young artist, relative obscurity, and reemergence in his 80′s with major shows. 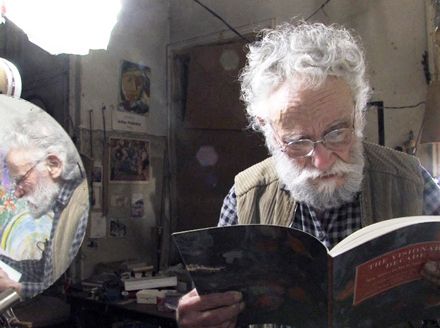 Now in his 90’s, Arthur lights up the screen with his brilliance, humor, and eccentricity – still painting day and night in his art filled, ramshackle ‘Grey Garden’s’ Victorian house. The film takes you inside his fiercely creative mind, unconventional artistic process, and counter culture family of Artists. Release From Reason is a fascinating exploration of a life devoted to art at all costs for over eight decades, and the mysterious forces that fuel creativity.